Pennsylvania is located in USDA zone 6, which is in the Mid-Atlantic part of the country. Due to the state's moderate winters and warm summers, a number of fruit trees grow quite well. From apples to peaches, there is a great variety of fruit trees to choose from when thinking about what to grow in your home garden. 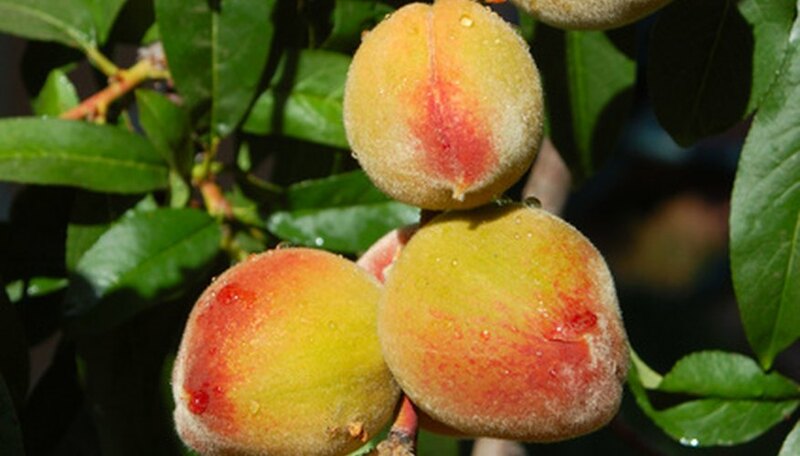 "Stone fruit" trees are ones that bear fruit with a large, hard seed inside. Common stone fruit trees that grow well in Pennsylvania are peaches, nectarines, plums, apricots and cherries. Most stone fruit trees grow best in warm climates, because they could become injured from severe cold. Even though Pennsylvania sometimes has harsh winter weather, these trees tend to be hardy. When planting these types of trees, try to place them in an area where they are shielded from high winds. Non-stone fruit bearing trees--such as apples and pears--tend to be a little hardier in Pennsylvania. These trees are more tolerant of colder weather than the stone fruit trees. As a home gardener, you can grow a variety of apples and pears that you might not find in your grocery store. The biggest consideration for home gardeners growing apples and pears is disease and pest management. Both will require attention on a regular basis. While not officially trees, there are a great variety of vines, brambles and bushes you can grow that bear fruit. Grapes, raspberries, blackberries, blueberries, gooseberries and hardy kiwis are all great choices for growing fruit in Pennsylvania. Many of these fruits--particularly raspberries and blackberries--need minimal attention to produce an abundance of fruit. Lori Litchman is a freelance writer based in Philadelphia and has eight years of experience as a professional writer. She holds a master's degree in education and an M.F.A in creative writing. She has been published in "The National Law Journal," "Forest," "Pennsylvania" magazine and several online publications. She has also worked as an environmental educator.